The Eye of the Storm looks impressive on paper, but in the cinema it is difficult to watch. The film is based on a novel by Patrick White and follows the last days of the wealthy Mrs Elizabeth Hunter (Charlotte Rampling). As her health deteriorates, her children Basil (Geoffrey Rush) and Dorothy (Judy Davis) fly back from their overseas hiding places and Mrs Hunter is instantly suspicious of their motives. As her illness causes her to fade in and out of reality and memory, the audience learns of the woman’s unkind character and the effect this has had on her children. Meanwhile, she is dutifully served by her nurses, housekeeper and lawyer until the very end. This film isn’t poorly made; it’s just not very enjoyable. The cast is filled with iconic Australian actors, yet there are only two semi-likeable characters: the nurse Flora (Alexandra Schepisi) and the housekeeper Lotte (Helen Morse). It’s especially hard to watch Rush in such an ugly role, so soon after his Oscar winning performance in The King’s Speech. That being said, he portrays a flailing theatre actor very well for someone whose own career is thriving. Mrs Hunter though, is the most aggravating character of them all. She is cruel, self-interested and manipulating, and seems to show little remorse for the things she has done. It is hard to feel any affinity for her, which makes enduring the two hours that focus primarily on her, somewhat painful. Within the two hours there are some moments that are more than bearable. The cinematography is impressive, especially the image of a tiny Basil walking beneath the huge shadowy curves of the Sydney Opera House. It’s always nice to see some familiar scenery, and this movie captures it especially well. The story of The Eye of the Storm is painfully unhappy. Again, in theory it is very well made. It’s not that the plot isn’t believable or that the characters don’t seem convincing—perhaps it’s exactly the opposite that made the film an unpleasant experience for me. 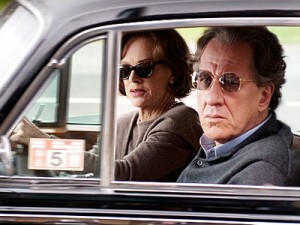 This entry was posted in Film and tagged australian, film, geoffrey rush, judy davis, Review, the eye of the storm. Bookmark the permalink.